Want to get free access to my "30 Ways to Become an Empowered Artist" course? Get on the Creative Entrepreneur VIP List. It's free and easy. Jamey Stegmaier may be one of the most successful people I've interviewed. He took a childhood interest and turned it into a thriving, multi-million dollar business. That makes him a guy worth listening to. 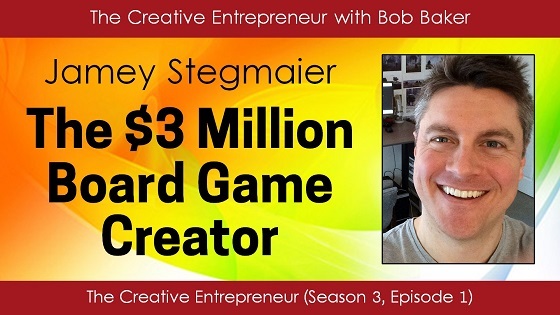 His company creates board games for niche audiences. He used Kickstarter to raise a total of $3.2 million over several campaigns for different games, each one raising more money than the previous campaign. Jamey's business philosophy is based on engagement, interaction and delivering value to his community. His attitude is infectious. You don't have to be a board game creator to benefit immensely from his wisdom. So listen up! Please visit my Patreon page at https://www.patreon.com/bobbaker - where you can support the Empowered Artist Movement, my mission to educate, inspire and empower creative people around the world.